Two Tales of a City opens in Hamilton! As February wrapped up, we prepared our bunting and banner components to be shipped up to Hamilton for the install. Sara and I went to Canadian Tire to buy Scotch Guard to weather-seal and water-proof the work. We bought two different kinds, both sealed the fabric adequately after setting to dry for a few hours. Next, we stopped off at Jodi‘s studio in The House to help her finish cutting and sewing the rest of the Helvetica text letters. The letters are black with a backing and a layer of Heat N Bond Ultra adhesive in between, for mass and stiffness. Jodi had mentioned that she was fortunate her surger hadn’t had any problems throughout the project. Shortly thereafter, a needle bent and we had to switch to her other machine to complete the remaining letters. Once all materials were in one place, we counted, folded, and packaged everything up to fit neatly in this tiny little box. (Amazing!) This was sent off earlier on in the week to Hamilton Artist’s Inc so that Julie could start the install before we arrived on the 9th. Once in Hamilton on March 9th, we headed to Hamilton Artist’s Inc to check out how the install was going. The bunting looked awesome on the front of the building! Another shot from James Street. Pieces of this bunting will be distributed to various individuals and organizations in the final stages of the project. The banner along Cannon Street, an unforseen frosty wind tunnel, wasn’t fully installed yet. We helped Julie measure and install for a few hours. The install was a lot more slow-moving than expected, mainly due to the wind. We were able to get a few letters up before heading over to the Farmer’s Market to set up for the workshop. This space, called the Community Kitchen, is for rent by the hour in the Hamilton Farmer’s Market. A white board wall? Pretty awesome. Wish we had one of these on hand at all times! The workshop began with a discussion about headline stories that the rest of the country hears about Hamilton, then we started talking about the local stories, both published and passed on orally, specific to the city and city residents. We ran the workshop in both French and English, as we had both French and English speaking people in attendance. Julie was on-hand to help translate. I wrote attendee’s comments and answers on board-meeting-sized sheets of paper lined up on the wall. We then moved the conversation toward places in Hamilton, favourite places, places you avoid, places you go to speak/hear french. Julie helped out with writing when a lot of good things were being said and I couldn’t keep up! Everyone had a lot of good insights, as most were originally from Hamilton, or just generally curious and good observers of their city surroundings. Stories of development for buildings previously sitting vacant in the downtown core, tales of infrastructures designed to keep people moving, failed and forgotten industries, rumours of neighbourhoods with bad reputations and stories of missed and seized opportunities were all shared. This woman, a francophone, had a lot of insights into local francophone culture. She also told some amazing personal stories about her experiences as a francophone in Hamilton. Some favourite places in Hamilton: James St N, Bibliothèque central, Musée sea beaux-arts de Hamilton, The Starlite, among others. We then passed along a big sheet of paper and re-wrote an exquisite corpse-style history of Hamilton, in Franglais. Starting with the past, the story moved through to the present and then the future with each participant’s additions. As the story was being passed around, we began work on our collaged maps. Using scraps of fabric, card stock, glue and sharpies, participants made artistic maps of a site, place or space in Hamilton discussed previously. I used these strips of arrows to show one-way roads in the downtown core, namely Main St, and King St. There were lots of fun materials and patterns to pick from. Here a participant is adding to the Hamilton narrative while another is making their map. Finished brainstorm sheets; What stories is Hamilton telling the country? What are the local stories that nobody else gets to hear? Where was the first place you visited in Hamilton? What is your favourite place in Hamilton? What places/things/people do you avoid in Hamilton and why? Where can you hear people speaking French in Hamilton? And finally, where is the heart of the city? The general consensus is that Jackson Square, the multi-use complex that hosts the Farmer’s Market, the public library and a mall in the downtown core, is the heart of the city. Also, the monthly Art Crawls that happen the first Friday of every month were also considered to be a driving force in the city. We decided this question needed to be asked to more people, so we took it back to Hamilton Artist’s Inc to ask Art Crawl attendees. Back at HAI, we set up a table in the lobby for Art Crawl perusers to interact and participate. Signs in both English and French were displayed, asking Art Crawl-goers to draw us a map of the heart of the city. With super-sized post-its and some bright coloured sharpies, we thought this activity would be fun and quick for people of all ages and abilities attending the Art Crawl. I drew an example, a rough interpretation of Jackson Square. Everyone was having so much fun drawing maps during the Art Crawl! We had to leave before the night was over, but we are looking forward to having a look at these maps, and possibly including them in the forthcoming Two Tales of a City publication. Watch out for more messages over the next two months! Want to participate? Fill out our Hamilton form, aussi en Français. Deux Contes d’une Ville (9 Mars – 4 Mai, 2012 à Hamilton Artists Inc. ) vise à examiner une gamme de dualités sociales, économiques, culturelles et politiques soulignant le passé, le présent et le futur de la Ville de Hamilton. À partir de la recherche amassée des archives et de l’histoire chronologique de la ville, d’interviews et de questionnaires, Deux contes d’une ville nous présente des narrations de Hamilton en conflit, entremêlées et parallèles en utilisant une bannière à grande échelle, une série de fanions surdimensionnés, un atelier et une publication rétrospective vers la fin de l’exposition. S’il vous plaît contribuer à l’exposition en remplissant le formulaire ci-dessous et contez nous vos histoires de Hamilton. Over the past few weeks, we’ve been testing out methods for transferring photocopies onto fabric using acrylic medium for the banner and bunting that will be installed on the exterior of Hamilton Artist’s Inc.
Rosina picked up this 1000ml tub of acrylic medium for The Store at SoVA‘s Store. We had some leftover scrap material to play with that we picked up from our technician and collaborator Jodi Green‘s studio at The House. Using some photocopies of historical articles we collected from the Hamilton Archives regarding francophone feats and struggles and both the textile and steel industries in Hamilton, we got to work doing a few different test transfers . The medium is applied directly to the fabric then the photocopied paper is placed over the fabric and rubbed in to ensure a crisp image. We tested on both light and dark coloured fabrics, as well as pure white, to see the difference from one tone to the next. Then, we set our tests to dry overnight in the BFA studio at the SoVA. Here’s an example of the bacl side of one of our photocopied articles. The text was photocopied in reverse so that it would come out onto the fabric in the correct direction. The back of on of our tests before setting to dry. After the first tests had dried at least 24 hours, we got to rinsing them to see the results. They came out nice and clear! Here’s an example on white fabric. Another sample soaking for a few seconds in cold water. After trying a sample with hot water, we soon realized that the heat was removing some of the transfer. It seems that cold was the way to go. Next we decided to do a few more tests on a larger surface area to play around with style and placement of the photocopies on the fabric. Hiba was around working in her studio and giving us helpful hints for rinsing out the fabric transfers. The remnants of paper post-rinse. Sketches describing two different methods for transfering; one with medium painted directly on the fabric, the other is painted onto the paper then pressed into the fabric. Our tests from last time drying. They all turned out well. Some were more interesting than others. Old photographs of sewing machines made in Hamilton & Region during the 1800’s. After picking up the squares from Jodi, we placed them out on the floor in the general shape of the sign they will become. I rinsed off the larger tests we had done from last time. Here’s the first test, medium painted on paper. The edges were curling and the transfer was not very durable. Two of the tests hanging to dry. The one on the right will be similar to the end results. Just for fun, we did a test with clear glossy medium (rather than solid matte) The results were interesting and cool but would only work well on solid coloured fabric. Future t-shirts perhaps? 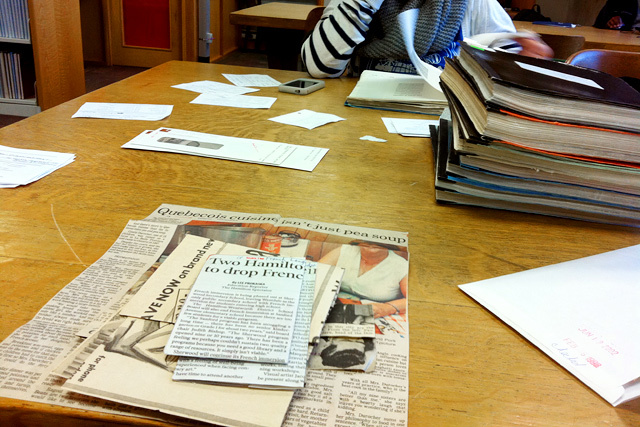 We started by cutting up all the photocopies in preparation for transfering 16 36″x36″ squares. We also arranged the events from the timeline Hiba and I compiled during our last trip in Hamilton to be photocopied and transfered onto the Hamilton History timeline bunting. A giant pile of pre-cut photocopies. After Cristina arrived to help, the pile of 8.5×11″ paper was reducing quite fast and we plowed through it in no time. Dried samples from previous tests. Our photocopied strips ready to go. It proved useful to dedicate a whole table for laying them out. I wipe down the table before laying out two squares for transfering. Always important to start with a clean work surface! Soon after, Rosina and Kevin joined us. We laid out the strips before securing their placement with the gel matte medium. We went with a broken grid pattern that sometimes crisscrosses over and under itself. We had fun! We decided to keep working until we ran out of medium for the day. We each hard a slightly different method for applying and adhering the transfers, all with the same basic idea; paint the medium onto the fabric then rub and scratch the paper into the fabric. After cutting up all of the articles and finishing to transfer 8 / 16 squares (each one will hold a letter to spell a word on the giant sign on the side of Hamilton Artist’s Inc), we ran out of medium and called it a day. Rosina will be finishing these squares today and we will get started on transferring the bunting on Thursday. This week, Rosina and I spent two days in Hamilton researching for our upcoming project at Hamilton Artist’s Inc. Two Tales of a City will uncover, celebrate, and imagine a future for lost histories of Steel City. A few weeks ago I met with Andréanne Baribeau of Windsor’s local French CBC radio AM 540 on the Y a pas deux matins pareils show to speak about Broken City Lab’s ongoing projects Make This Better and How To Forget The Border Completely. The details: Saturday, March 20th at 3pm, meet at the corner of University and Pelissier. 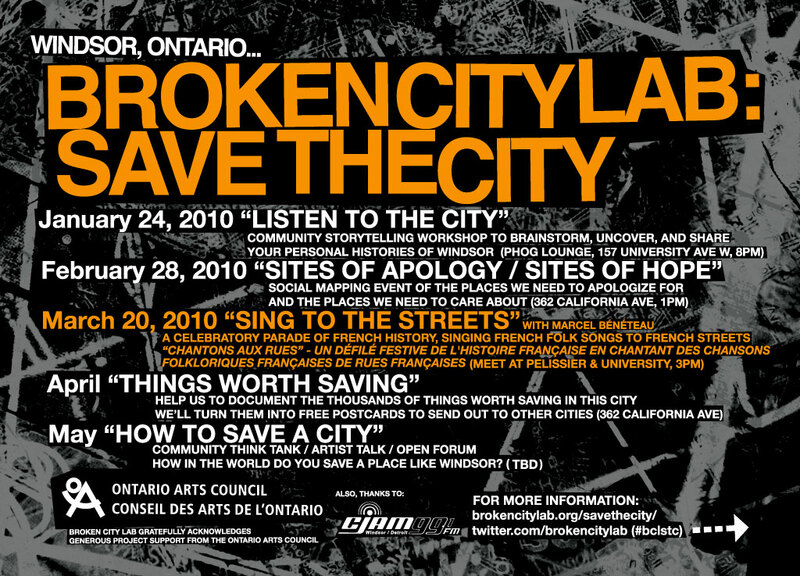 As part of the Broken City Lab: Save the City project, and to better understand the city and its rich and failed history, Broken City Lab researchers will invite the community to learn the Francophone history of Windsor through a collective performance and storytelling of traditional French Folk Songs native to the Detroit River region on Saturday, March 20th at 3pm. Led by Dr Marcel Beneteau, a professor in the Department of Folklore and Ethnology at the University of Sudbury, participants will meet at University Avenue and Pelissier Street to take part in a walking oral history tour and performance, which will stop at the streets along Riverside Drive named after Windsor’s French settlers such as Goyeau, Langlois, Marentette, Louis, Parent and Pierre. The retelling of the brief oral history at each street will be followed by a collective open performance of the French Folk song led by the local Francophone musician. Video and audio documentation of the performances will subsequently be made available on the Broken City Lab / Save the City website.